Inspired by the incredible crews of the modern day HC-130H Hercules. 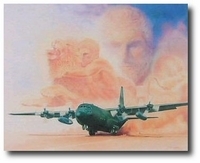 The C-130 Hercules primarily performs the intratheater portion of the airlift mission. The aircraft is capable of operating from rough, dirt strips and is the prime transport for paradropping troops and equipment into hostile areas. Basic and specialized versions perform a diversity of roles, including airlift support, DEW Line and Arctic ice resupply, aeromedical missions, aerial spray missions, fire-fighting duties for the US Forest Service, and natural disaster relief missions. In recent years, they have been used to bring humanitarian relief to many countries, including Haiti, Bosnia, Somalia, and Rwanda. The turbo-prop, high-wing, versatile "Herc" has accumulated over 20 million flight hours. 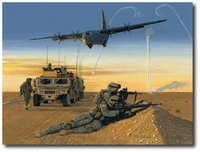 The C-130 Hercules has unsurpassed versatility, performance, and mission effectiveness. "Metaphor I: The First Labor of Hercules"